Sound masking systems & devices for speech intelligibility, privacy & comfort. We offer a free assessment of your office or commercial space across London & the UK. Our assessment will address issues of speech privacy and ambient noise levels. We will help you achieve optimal sound masking in your space. Contact us for a free site survey & assessment. We offer a supply & installation service across Soft Db's range of sound masking products and devices. This includes the full range of controllers, speakers, sensors and other accessories in Soft dB's range. Soft DB's patented automatic calibration and real-time volume adjustment means once the installation is complete you can forget about annoying adjustments and experience perfect sound masking 24/7. Soft dB systems are the only sound masking devices that include real-time adaptive volume adjustment and touch-point anywhere capabilities, plus a range of other exclusive features. We offer a free demo of Soft dB’s sound masking systems at our London office. We have a comprehensive sound masking system installed throughout our office, which features an open-plan work floor, partitioned meeting room, break out space and kitchenette – so you can experience the benefits of sound masking in a variety of spaces. Our office is located in Deptford, South-East London, a short journey from London Bridge station and Central London. Soft DB sound masking systems allow room users to control the input of sound into offices, restaurants, classrooms and any other space. Sound masking ‘masks’ environmental sounds , drowning out disruptive noises. A Controller: Controllers are the brains of sound masking systems. They are where sound is configured and relayed to speakers. Speakers: The speakers emit the background sound. Each different controller supports a specific number of speakers. The controller wirelessly relays data to strategically placed speakers. Sensors: Sensors allow for the automatic adjustment of the sound masking systems. The sensors detect the ambient noise level in the room and can either reduce or increase the level of sound masking. With Soft Db’s Smart SMS-NET app, room users can adjust the volume of sound masking and music in the demarcated zones within the office or space. System administrators can allocate certain zones to certain users, or can have complete control over the whole system. The app scans for controllers in the space, and once found it will display the sound masking projects available to the user. The user can then adjust the volume based on the demands of the space at that time. The Smart SMS-NET app is available on both Google Play and Apple App Store. No one office is the same as the next. Each office has different sound environments, demands and user routines. The beauty of SmartSMS is its ability to adapt to the ever changing sound environment of any given space. When the office is particularly loud, the systems will increase the level of sound masking to improve user comfort. 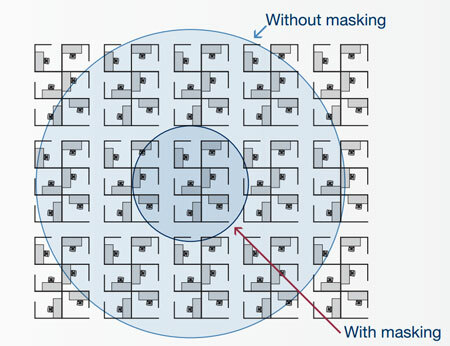 Conversely, when the space is quiet, SmartSMS will act more discreetly, with lower levels of sound masking. Soft DB’s SmartSMS systems adjust the level of sound masking every 15 seconds and can be active 24 hours a day, if needed. 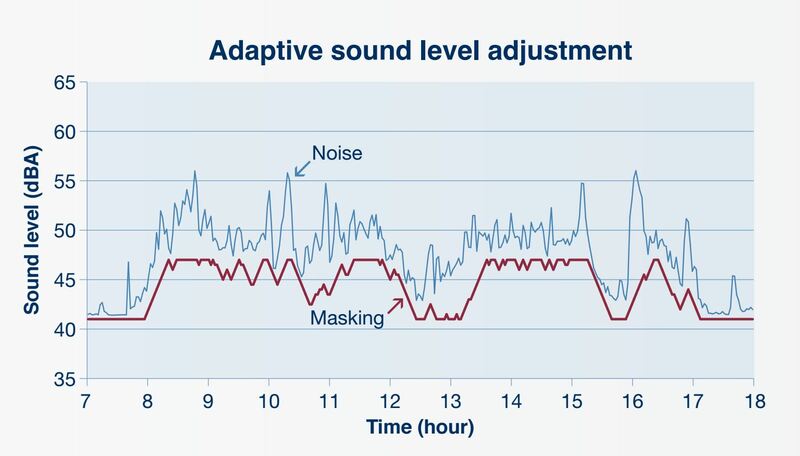 The adjustment system (US 8116461 B2) can detect subtle changes in ambient noise levels using sound level sensors installed throughout the space. Signal-processing allows the controller to automatically adjust the level of sound masking required. Soft DB’s patented calibration system allows the SmartSMS systems to take specific physical variations in workspaces into account when emitting sound masking noise. Acoustic environments are influenced by room size, surface finishes, ceiling types etc. 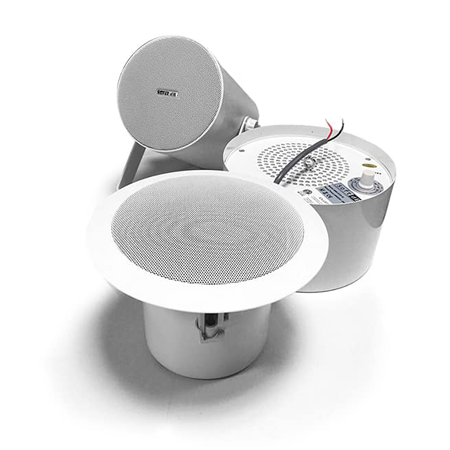 SmartSMS uses a sensor system to monitor the variations in how each space’s unique characteristics respond to the acoustic environment. 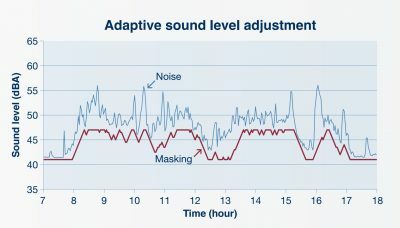 Based on this data, it automatically calibrates the noise spectrum that must be used to emit a non-disruptive sound masking noise.